The Atwater Library was one of the first Canadian libraries to offer public access to computers, and we continue to be a community meeting place for those in need of digital and internet connections. We have a bank of 12 Windows PCs. For those with their own laptops, we offer free WiFi throughout the building, and beam a signal to Cabot Square Park as well (in partnership with Ile-Sans-Fil). Computer usage is $4/hour for non-members, $2/hour for Library members, while WiFi access is free. 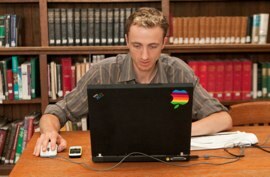 We also offer a range of low-fee computer courses and workshops. For renting information, please see Room Rentals.